[by Ent Team] ‘Midnight Runners’ trailer has been released. 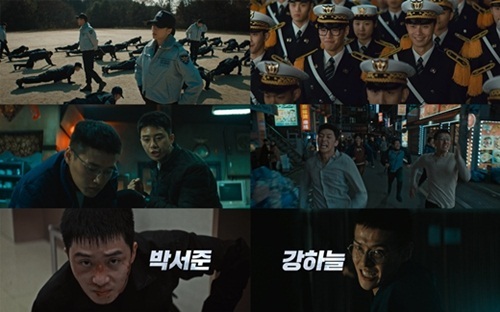 The main trailer shows the police University entry oath that sonorously brought the recruits to tears as well as scenes of them receiving harsh training, capturing the attention of fans of the movie. In addition, bragging of a man’s charm, Ki Joon (Park Seo Joon) who reacts first upon his desires and showing off a smart but sloppy charm is fundamentalist Hee Yeol’s (Kang Ha Neul) images give a peek into the individuality and freshness of youths in their 20s. The turn of atmosphere in which they accidentally saw a kidnapping and how that would unfold once they were forbidden to investigate raises the tension. “You are not police. You are still students!” yells Professor Yang (Sung Do Il) who wants to wash himself clean from the incident. The cops are in a fit as they were shot by Taser guns, causing laughter while at the same time, the teaser alludes a difficult investigation process at the same time. Previous article‘Radio Star’ Choi Min Soo, Real Disclosure on Wife June Kang…Obstacle to Acting Lifestyle?